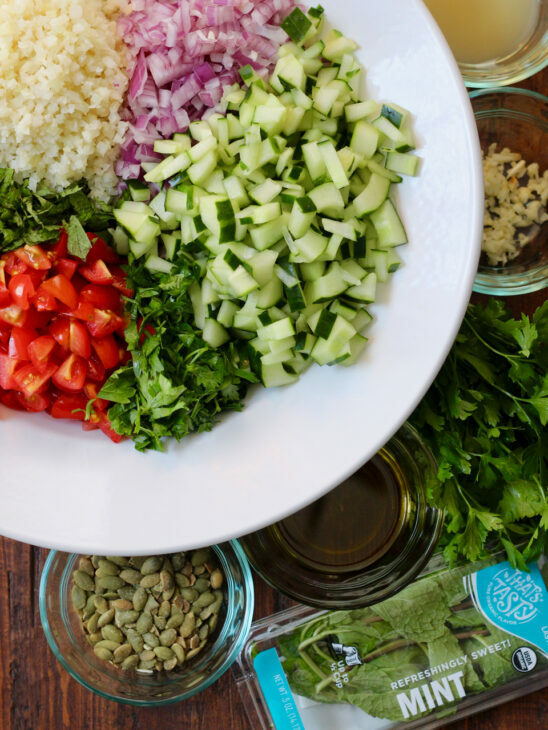 Tabbouleh is a colorful Middle Eastern salad that’s traditionally made with fresh herbs, bulgur, onions, tomatoes, olive oil and lemon juice. 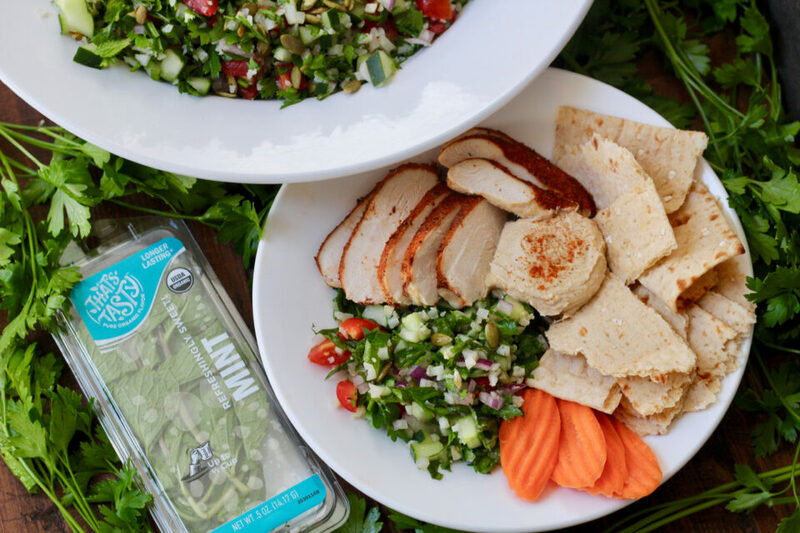 Our version is chock full of veggies and vitamins, which makes a wonderful side to include in your weekly meal rotation. Sweater weather has officially arrived… but we’re keeping a few skinny jean recipes on hand, just in case. With only 25 calories per cup (verses over 200 calories per cup of brown rice), cauliflower rice is a great option for those who are trying to watch their waistlines. You primarily want to use parsley’s luscious leaves in this recipe. A few small twigs are fine but try to separate the leaves and stems as much as possible prior to chopping. Similar to parsley, you want to embrace the mint leaves only. To chiffonade mint into ribbons: simply stack 5-6 leaves together, roll up into a tube and cut it into thin slices. Look at you… you’re now a chiffonade master! Cut the cucumber in half, lengthwise, and scoop out the seeds with a spoon. Then cut each half into five strips and then chop those strips into smaller pieces. Once the cauliflower is cooked, it’s really important to let the beads cool to room temperature. If you add warm ingredients to the fresh herbs, they will wilt and make the salad soggy. Raise your hand if you like soggy salads? Said no one, ever. We suggest that you place the cauliflower into the fridge for at least 30 minutes to cool after it’s been cooked. We added pumpkin seeds to this recipe simply for a crunchy texture. Also… it’s fall, y’all. Hooray for pumpkin season. You could substitute this with almond slivers, sesame seeds or pistachios, if desired. Cook cauliflower, according to packaged directions, and allow to cool completely. In the meantime, chop all herbs and vegetables. Place all ingredients in a large bowl and toss until mixed. 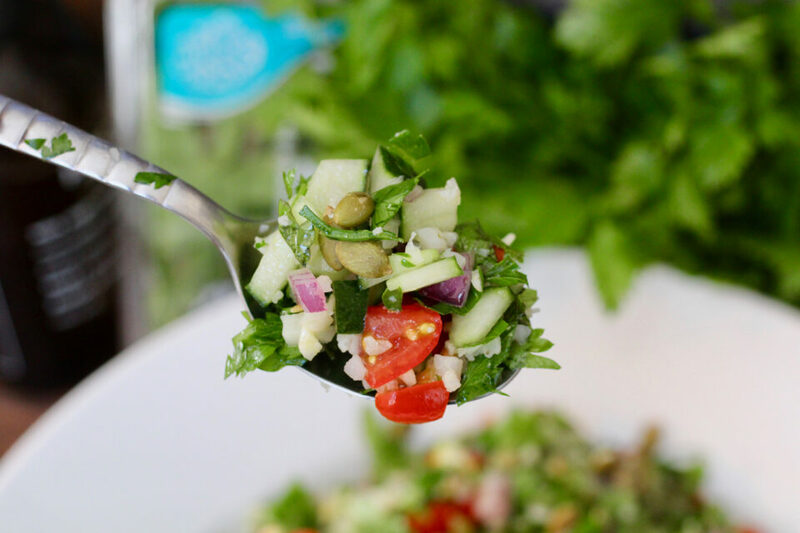 Serve this salad alongside roasted chicken, hummus and pita bread. Mmmm. 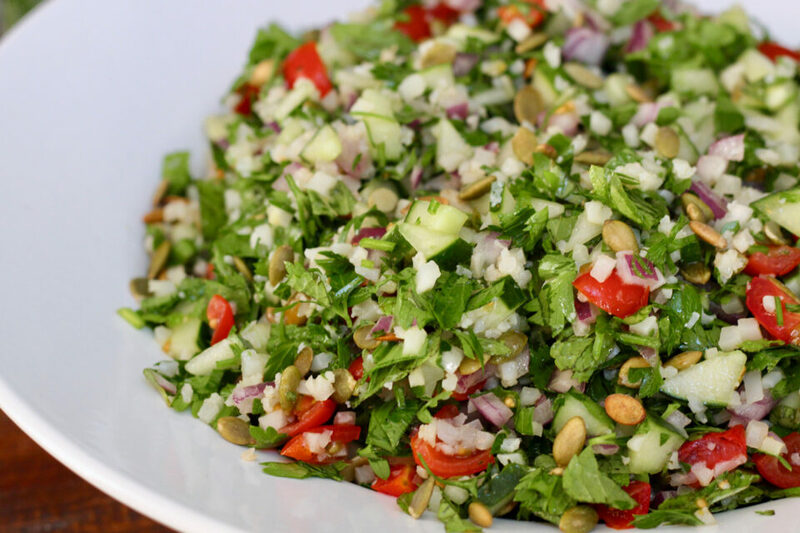 If you prefer to prepare a traditional Tabbouleh, you can substitute the cauliflower with bulgur. For variety, quinoa is also great option. We used red onion in this recipe, but if the flavor is too strong you can substitute with a sweet yellow onion instead. This salad pairs fabulously with chicken, steak, shrimp, salmon and tofu. It’s a universal side dish that everyone will appreciate. One small clamshell of cherry tomatoes is equivalent to one pint. 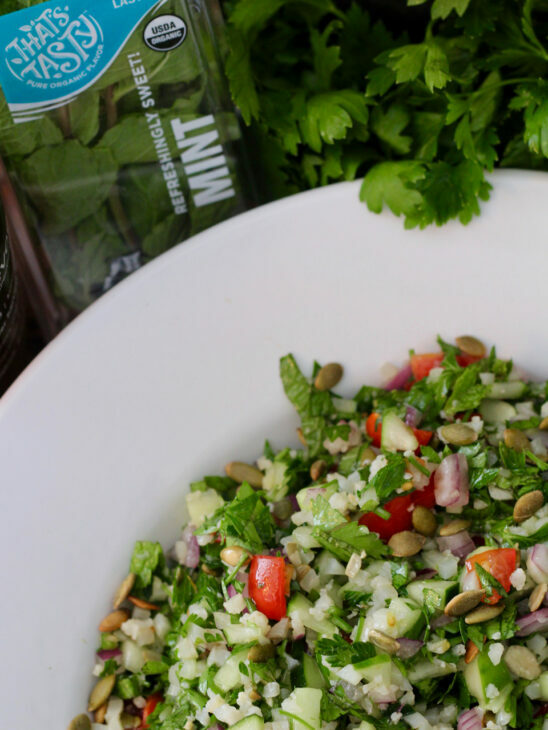 The base recipe for this Cauliflower Tabbouleh is Whole30 and Paleo compliant. Yay!